Ironman Run Style – Gazelles vs Gliders, and How "Should" You Run? What follows is a brain dump in condensed form – a run technique manifesto derived from what is now years of studying high speed videos of the best runners on the planet. There is plenty of advice out there these days as to how you “should” run. How your foot “should” land. What your arms “should” do. How much you “should” bounce. What your cadence “should” be. My conclusion is that you “should” ignore most of this advice. I have identified two distinct running styles exhibited by Ironman’s best runners. They are dramatically different as the video above illustrates. One group, the “Gazelles”, spend half of each stride airborne, gaining altitude after toe-off in a clear projectile-motion path. The other group, the “Gliders”, spend about half as much time in the air, and more or less fall off their back foot onto their front foot while exhibiting notably higher turnover. 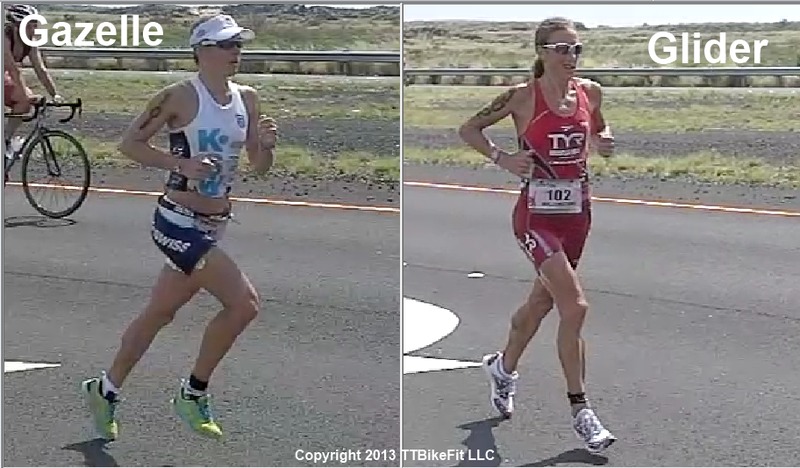 Very different styles, yet we have practitioners of each throwing up 2:52 Kona marathons on the women’s side. Gazelle Carfrae vs Gliders Wellington and Snow. So I am not going to tell you how YOU “should” run. But I am going to try and point out why one style MAY be better for average age group runners, and perhaps most women, even pros. Physics drives my arguments and observations. Even fast runners cannot escape the simple laws of physics. So too, if you want to run your best, whichever style you adopt, you must be strong, stable and mobile. Period. There is no silver bullet that will make you a fast runner if you lack the foundation. You must be able to extend your hip, and you must be stable and strong enough to avoid leaking energy. 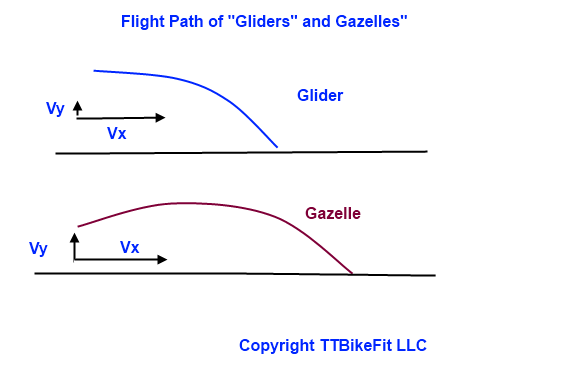 The basic differences between Glider and Gazelle technique can be seen in the video. But to summarize, both runners exhibit similar back leg extension at the moment of toe-off. However, the front leg position is different. Gazelles are less open with the lead foot under center of mass and exhibit more forward lean, whereas Gliders are fully open at the hip (front knee at maximum displacement) and the front foot has already swung well out in front of the center of mass. In fact this swing likely generates some of the forward velocity. We think of this as being similar to skating. 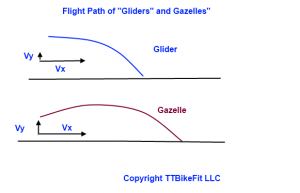 While the Gazelle gains a bit more altitude after toe-off, likely aided by additional upward knee drive, the Glider mostly falls onto the front foot. So flight time is short. The Gazelle is still flying around up there while the glider is working towards their next toe-off. Classic run form, the one you see world-class marathoners use – all of them – is gazelle-like. By that I mean the runner exhibits a relatively large amount of vertical oscillation – 4-6″ typically, during which time the athlete flies through the air. (YES “bouncing” is necessary if you want to run like a gazelle – physics won’t let you move at elite speeds without significant flight). We will now introduce a KEY physics concept: vertical and horizontal motion are INDEPENDENT of each other. The amount of TIME a runner spends airborne is solely a function of how much vertical force (and hence velocity, Vy) he has on toe-off. It does not matter how fast a runner is moving in the horizontal plane (Vx). The runner is governed by the laws of projectile motion. If you hop straight up, the velocity you leave the ground at determines how high you will jump, and how long you will be in the air. Same thing for a runner. So Gazelle runners use some amount of vertical force and the resulting Vy to gain altitude after toe-off, and hence remain in the air longer. Now, the faster a runner is going, the more ground he will cover while in the air. And this is key, because we find that in fact Gazelle runners typically use a cadence very close to 90. So to go faster at a steady 90 cadence, you must go further with each step – increase your stride length by flying through the air, because there is only so far you can open your legs. Flying is good in that while you are soaring, there is effectively no energy cost. But there is certainly an energy cost to generate that Vy which launches you up there, and to absorb it on landing. Race walking serves as the opposite condition. Race walkers are not allowed to fly at all – even though they do for about .02-.04 seconds. The rule is just that it must not be perceptible to the judge’s eye, and .04 seconds of flight seems to be the maximum safe amount. In comparison, we find the typical Gazelle runner spends .17 seconds airborne. Elite race walkers exhibit stride lengths of around 4 feet, and cadence of 100-105. This limits their top end speed to about a 6:25 mile pace. Now to get this stride length they use hyper-extended knees and unusual-looking hip gyrations. But effectively no flying, no Vy. And under these conditions, their speed is limited by the humanly-possible stride length and turnover rate. Elite marathoners travel at faster than 5 min/mile paces, yet our (and many others’) observations find that they tend to use a 90 cadence. The table below shows that each stride must be 6 or more feet in length. We have already seen that race walkers top out around 4′ per stride (no flying), indicating that the marathoners must fly at least 2′ per stride. likely more. 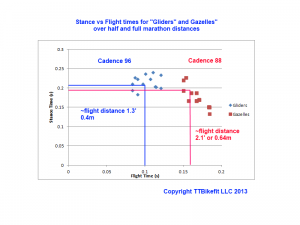 Interestingly, we find that during the typical .17s flight, a marathoner moving at sub-5 pace would fly almost 3′. What about the Gliders? We find they are only airborne about .1 seconds. Why? No Vy. Gliders achieve maximum vertical displacement at toe off, and then effectively fall onto their front foot. As opposed to a projectile, their travel through space is more like an object that is slid off of a 3″ high table (the vertical displacement at toe-off) at whatever Vx they are traveling at. So without the altitude gain, they spend less time in the air, and hence cover less ground. But they can and do turn over faster. We find that support times for both groups of runners is very similar. It is only the difference in flight time that makes for a shorter stride duration and hence quicker turnovers. While elite marathoners run at 90 cadence, we find Ironman Gazelles often run closer to mid 80s. But Ironman gliders are typically mid 90s cadence or higher (pushing 110 in Cait Snow’s case). When you watch the video above, it is striking how close to the ground the gliders stay – how little flying they are doing. Yet they go as fast as the gazelles, at least in Ironman. So the question is, is one style more efficient? The gliders don’t use any energy to generate a Vy. All of their energy goes to Vx – moving forward. Note that they often look as if they are skating just above the ground with no bouncing. BUT – they do need a faster turnover. The Gazelles must generate a Vy, and in turn absorb the same Vy on landing. Clearly more costly energy-wise – BUT – is active muscle contraction used, or is most of the force generated through muscle and connective tissue elasticity? If so, the additional energy cost may be greatly reduced. But if you don’t have springs for legs, trying to run like a gazelle is probably going to be very costly – especially if you aren’t one of wraith-like physique. Both run styles need Vx obviously – Newton (physicist, not the shoe) told us long ago that once an object is in motion, it tends to stay in motion. So a runner’s forward velocity should be fairly easy to maintain, if you aren’t braking on every stride. And here is my one sentence on foot strike – land however you like – just don’t brake. Unfortunately for Vx, we aren’t running in a vacuum (although it may feel that way to your lungs at the end of a race), so there is some energy required to overcome aerodynamic drag. Of course this is the same for both run styles assuming the same run pace. Clearly, at some pace, it becomes impossible to be a glider. The stride length or turnover needed becomes too great. We think this is around 6min/mile. Much like race walkers top out at around 6:25, gliders with their shorter flight time and hence shorter stride length succumb to cadence limits at some pace. But for most of us, especially in Ironmans, running a 7 min mile would be huge. 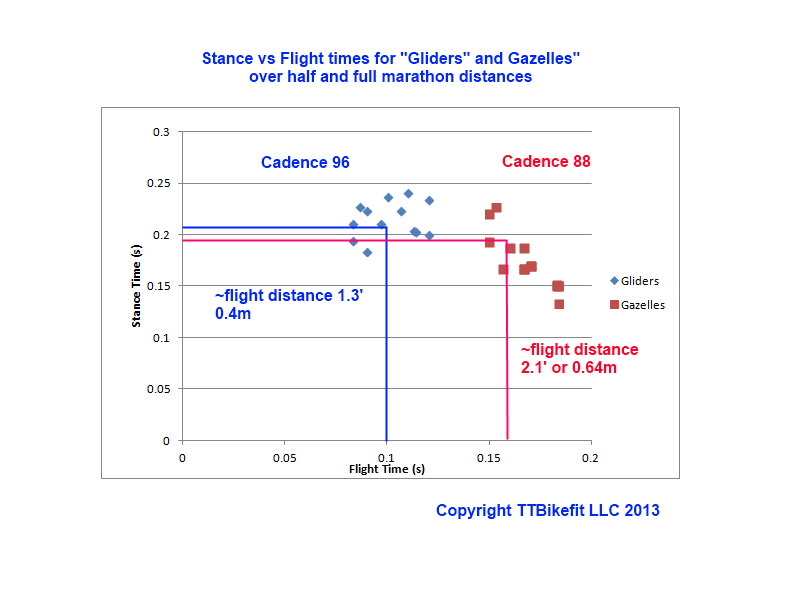 The table shows that at a 90-95 cadence, you need about 4′ per stride. If you can open your legs to a 3′ stride width, then you need to fly a foot – very doable using the gliding technique. Yes you need the hip extension and glut drive to maintain the forward velocity. But you don’t need to fly much. Maybe, just maybe, this is the way most of us should approach long-course running. Heck, and 8min/mile pace is pretty darn good. In which case you can run at 90 cadence and travel 3.67 feet per stride. Clearly there is room for further study here, and I can think of several possible scientific studies on this topic. Why do we see few men using the Glider style? Pace limitations? Don’t know. We plan to keep working on this topic and conducting evil experiments on ourselves and any other hapless subjects we can find. How “should” YOU run? Maybe not like a resident of the African plains (human or animal). Maybe gliding is the ticket to faster more efficient running, at least if you are a long-course triathlete. 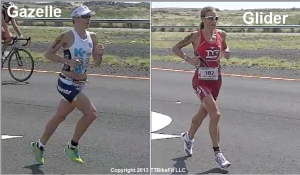 Pro Bike Positions: Kienle vs Potts vs TO in Kona	Ironman Run Style – Gazelles vs Gliders Part 2 – What Really Matters?